Looking to follow in the winning footsteps of his stablemate Imagine, the promising Don Eduardo three-year-old Valdivia will fly the flag for Ballymore Stables today in the Gr.2 Darci Brahma Waikato Guineas at Te Rapa. Imagine had travelled down to Hastings earlier in the week and scored her third career win in impressive style, and in doing so registered Ballymore Stales NZ 25th winner to date this season. Valdivia looks right on target to add to the win total this weekend, stepping out over 2000m for the first time in his career. Raced by JML Bloodstock Ltd (Mgr Lib Petagna) & Mark Wyborn, Valdivia has had three raceday outings, and was successful two starts ago when winning at Tauranga in December. Co-trainer Chad Ormsby has always had a very good opinion of the gelding and is looking forward to seeing him take on his first black-type assignment. 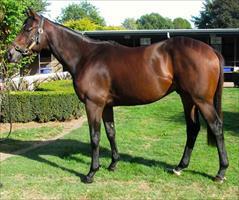 “Valdivia has always shown a lot of ability and he is a 3YO on the way up. He steps up over ground for the first time on Saturday and will be doing his best work over the final stages” said Ormsby. Valdivia will be joined on the Ballymore Stables truck bound for Te Rapa by stablemates Postnthyme (R1), Reachin’ Out (R3), The Last Shower (R4), She’s Samashing (R5), and The Hotz (R9). “We have a very good team in on Saturday and fingers crossed we can continue on the winning roll we are enjoying of late” said Ormsby.